Creekside Flats #407 is a stunning corner home with the best location in the buillding. 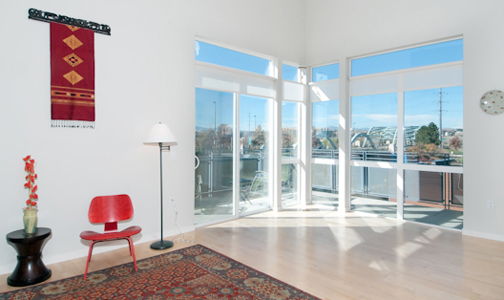 This top floor residence boasts 14 foot ceilings, expansive windows and a large wrap around deck. An open living area has a beautiful hardwood floors, a large island and gas fireplace. The master suite has a large walk-in closet and private bath. With incredible views of the mountains and Cherry Creek this home is a must see! Located at 1440 Little Raven Street, Creekside sits along the peaceful Cherry Creek and a quaint tree lined drive. To see this beautiful home, call me at 303.618.3622.